Retrofit LED Lamps have become a very popular solution for businesses and municipalities when it comes to saving energy, reducing maintenance costs, and operating more efficiently. Many facility managers and maintenance professionals have turned to retrofit LED lamps to replace their inefficient and unreliable HID systems. HyLite’s premier line of Omni-Cob retrofit lamps offers customers an ultra-efficient and reliable alternative to metal halide and high-pressure sodium lamps up to 500W. 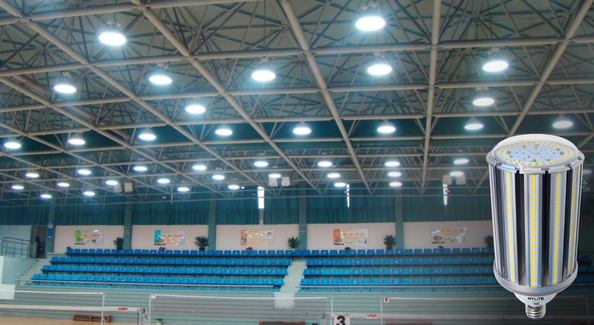 However, facilities and organizations using higher wattage HID systems (750W to 1000W) have found themselves without a suitable LED retrofit lamp to help them reach their goals of reducing energy use and maintenance costs. In light of this issue, HyLite is excited to announce the expansion of its highly popular line of Omni-Cob lamps with two new models: 150W and 200W. This new high performance, high output LED retrofit lamps are superior HyLite-quality retrofit solutions for applications up to 1000W HID. The HyLite LED Omni-Cob series already offers an extensive range of retrofit solutions with lamps from 8W to 120W. This expansion will provide even more opportunities for customers to slash energy consumption and eliminate maintenance costs associated with traditional metal halide and high-pressure sodium lamps. The new Omni-Cob lamps are suitable for fully enclosed fixtures and are IP 65 for use in the widest range of applications. In keeping with HyLite’s commitment to delivering unprecedented value, the new model Omni-Cob lamps will come with a free 10kA/20kV surge protection device. This device, which is already included with all HyLite Omni-Cob lamps 22W and up, will provide additional protection to ensure reliable energy savings performance through its Rated Lamp Life of up to 60,000 hours (17 years at an on time of 10 hours/day). With up to 140 lumens per watt, the new HyLite LED Omni-Cob models will provide new retrofit solutions for parking lots and area lighting, flood lighting, and high bays. HyLite LED Omni-Cob lamps allow users to bypass unreliable HID ballasts for additional energy savings and eliminate potential points of failure in the system. The 150W and 200W models are available in 120-277V, 347-480V, and DC Voltage options. For more specifications, please visit the HyLite LED Omni-Cob page here.